Sangeeta Sandrasegar is an artist whose practice explores post-colonialism and cultural hybridity within Australia and its relationship to migrant communities and homelands. Kate Beynon was inspired to transform Sandrasegar into a contemporary version of the goddess Durga. ‘Durga represents positive, feminine creative energy and a protective force,’ says Beynon. 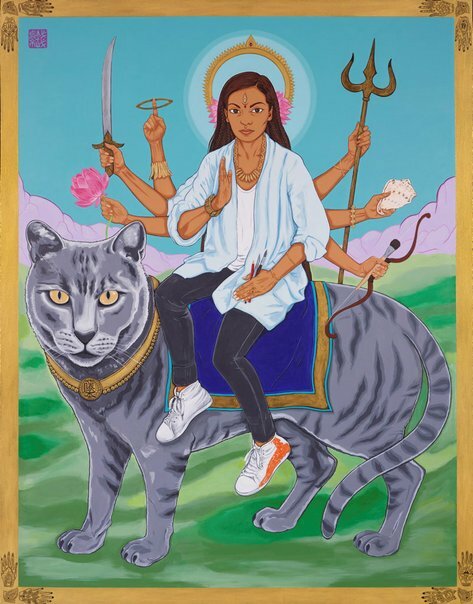 ‘Sangeeta embodies the warrior goddess as artist with guardian creature (her and partner Stefan’s cat Fujimoto morphed into tiger form). Her multiple hands hold special objects, such as the sword symbolising protection and sharpness of knowledge, along with Sandrasegar’s own artist tools – surgical scalpel, pencil and brushes. Born in Hong Kong in 1970, Beynon migrated from the UK with her family in 1974. She has a Bachelor of Fine Arts from the Victorian College of the Arts and is undertaking a PhD at Monash University. Participating in over 120 exhibitions, Beynon has been a finalist in the Sulman Prize, Portia Geach Memorial Award and Doug Moran National Portrait Prize. A five-time Archibald Prize finalist, she was highly commended in 2010.